A few months ago I wrote about my great uncle Fred Witt, a Skokie, Illinois firefighter. I was excited to learn that he isn’t the only firefighter in my family’s past. William Pepperney, my 2nd grand great uncle, served as a Pittsburgh fireman for at least 30 years. Thanks to the help of several distant relatives and members of the Pittsburgh Bureau of Fire, in the last week I’ve been able to piece together much of William’s career. As a firefighter myself, having this information is a treasure. William Pepperney was born 24 Dec 1875 in Pittsburgh, Pennsylvania to Frank Pepperney, Sr. and Margaret Buhl Pepperney. As a 24-year-old in 1900, he was a brass polisher living with Jacob Bahle and their family at 832 Perry Street. This Jacob Bahle is probably one in the same as my third great-grandfather and the father of William’s aunt Mary Bahle Pepperney. On 17 September 1905 (or 28 January 1907, depending on the source), William joined the Allegheny Fire Department. William spent his entire career at the fire station in Troy Hill, on Pittsburgh’s North Side. Before being annexed by Pittsburgh in 1907, Allegheny was a separate city. He was assigned to the ladder truck with Engine 11. After the 7 December 1907 annexation, the truck was known as Truck Company P then Truck 16. In 1910, William is living at 2011 Straub Lane with his wife Caroline. After 1924, it was Truck 51 before the city gave the truck companies the same number as the engine companies they were quartered with, now numbered Engine 39. The 1930 City Directory lists him at 1954 Ley Street, just two blocks from his firehouse at Ley and Froman Street. His wife Caroline passed away on August 11, 1937. William married Mary Swanger on November 16, 1940, interestingly listed as his housekeeper in the 1940 census. He passed away on December 26, 1946, when he was struck by a car in front of the fire station. William’s fire station, Station 39, served Troy Hill for 104 years until 21 March 2005 when it was closed during a round of budget cuts. 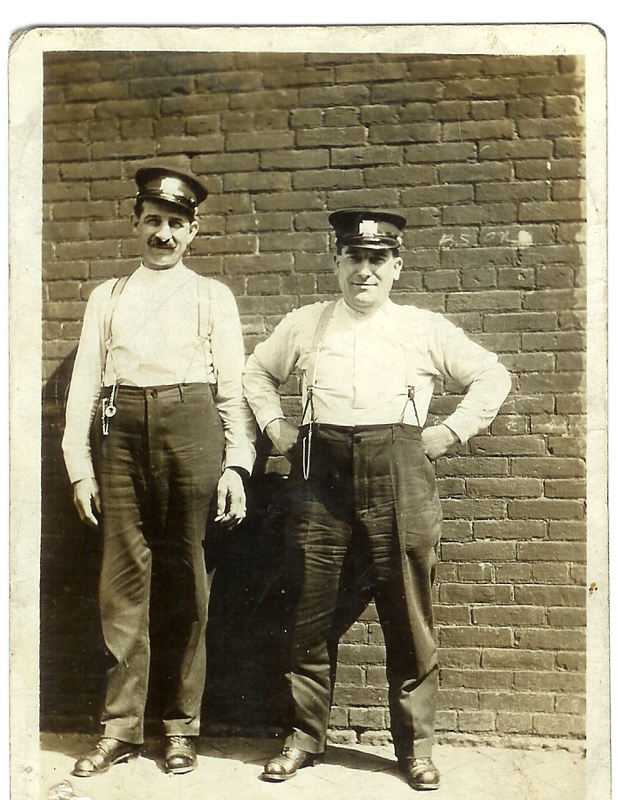 William Pepperney (right) with an unknown firefighter. The hat badges in the photo indicate it was taken before July 1916, when a new style of badge was introduced. Gary Stephens [(email address for private use)] to Joseph Lowry, email; 20 November 2012; “Re: William”; privately held by Joseph Lowry, [(Email Address) & Street Address for private use,] Sterling, VA.
James Pepperney, [(email address for private use)] to Joseph Lowry, email; 21 November 2012; “William Pepperney”; privately held by Joseph Lowry, [(Email Address) & Street Address for private use,] Sterling, VA.
John Gombita, Pittsburgh, PA, [(email address for private use)] to Joseph Lowry, email; 14 November 2012; “PBF History – William Pepperney”; privately held by Joseph Lowry, [(Email Address) & Street Address for private use,] Sterling, VA.